Gary Neville thinks the appointment is imminent. GARY NEVILLE SAYS he would be surprised if Ole Gunnar Solskjaer is not appointed permanent Manchester United manager during the upcoming March international break. Solskjaer took over as interim boss in December following Jose Mourinho’s departure and has led a remarkable turnaround in form which has seen the Reds bridge an 11-point gap to the top four. The Norwegian has also taken United into the FA Cup quarter-finals with victories over Arsenal and Chelsea in rounds four and five respectively. And Neville has been impressed by his former team-mate’s leadership. “He will. He’ll probably be the King of Norway, the President of Norway, the Prime Minister of Norway as well!
. 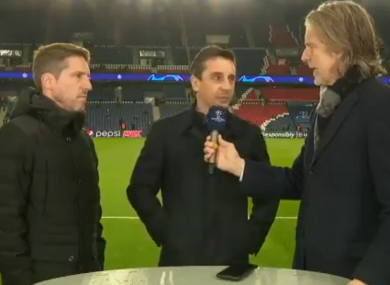 @GNev2: – I'll be surprised if Ole Gunnar Solskjær is not awarded the [permanent manager] job during the international break. “I can’t believe what’s happened. I thought when he first came in it was just to reconnect the club with the fans, the players, get everybody happy. “A safe pair of hands, someone who the club could rely upon to give good information to the board about what the players are like, and then they would appoint the best manager in the world. “Ole’s results are Premier League-winning title results. The form guide says it all. The performances are very good. The fans are loving it, it’s been a sensational three months and I think Ole Gunnar Solskjaer will get given the job. The right time for me was always mid-March to the end of March and that’s when the international break is. I will be surprised if Ole Gunnar Solskjaer is not awarded the job during the international break in the next couple of weeks. United face games against Chelsea in the Premier League and Wolves in the FA Cup before the international break causes a break in English top-flight fixtures over the weekend of 23-24 March. Email “Neville confident Solskjaer will get permanent Man United job during international break”. Feedback on “Neville confident Solskjaer will get permanent Man United job during international break”.